When it comes to Asian Cuisine, the two main ingredients in most dishes are rice and noodles. In Western culture, when we think of rice and noodles, very specific images come to mind. Rice is a side dish or added to a stir fry and typically is used when making Asian meals. Noodles on the other hand are almost exclusively used in Italian cooking. In Asian cooking, rice and noodles each have their place in specific types of meals and can also have a purpose much deeper than the physical ingredient. In Asian cuisine rice can be added to almost any meal, and typically rice is a major component of every meal eaten during the day. There are several different types of rice used in Asian cooking, but the most popular are Glutinous Rice, Non-glutinous Rice and Jasmine Rice. Glutinous rice, also known as sticky rice, sweet rice, or waxy rice is grown in Southeast and East Asia. This type of rice is opaque and becomes sticky when cooked. The name glutinous rice comes from the glue-like texture that the rice has when cooked and has nothing to do with the amount of gluten that the rice contains (it doesn’t contain any gluten). This type of rice is not any sweeter than any other type but gets the name because it is used in combination with sweet ingredients and is used to make some desserts. Non-glutinous rice is what most Americans would refer to as white rice. This rice becomes light and fluffy when it is cooked. It is typically medium or long grain rice and is used in main dishes. In China this type of rice is always served by itself on the side of a meal. In South Asian cuisines non-glutinous rice is incorporated in the meal by mixing it with pork or other types of meat. This is the type of rice that would also be used to make a stir fry dish. Jasmine rice is another type of white rice that is primarily grown in Thailand. 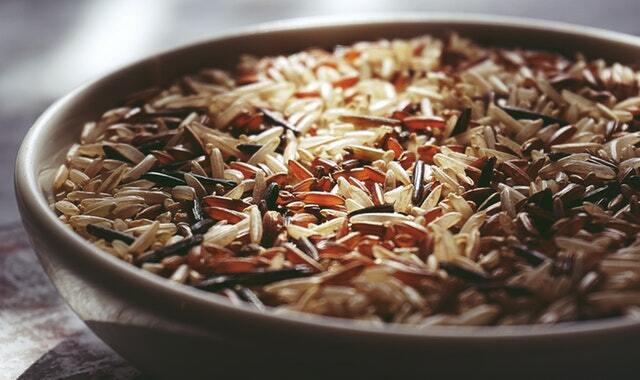 This long grain rice is also known as Thai Hom Mali, referring to the sweet fragrance that the rice naturally has. Although Jasmine rice is less sticky than glutinous rice, it would be considered much stickier than American long grain white rice. Jasmine rice is typically served as a side to a main meal and is eaten by itself. This is so you can fully take in the majestic aroma and delicate taste of the rice. When it comes to using noodles in Asian cuisine your options are almost endless. Each country has their own varieties which can be made with any number of ingredients including rice, yam and mung beans. These different types of noodles can be sold fresh, dried or frozen and are used for different purposes. Noodle sizes range from thick to extremely thin and are served in different ways. Many noodles in Asian cuisine are long in length and are used as a symbol for longevity and prosperity. The three most popular types of noodles used in Asian cuisine include “Mein” (meaning wheat) noodles, rice noodles and soba noodles. Each of these noodles plays an important part in creating authentic dishes. “Mein” noodles are the broadest category of noodles used in Asian cuisine. They can be made from a combination of wheat flour, water, eggs and alkaline, which gives the noodles their yellow color. These noodles range in size from approximately the size of angel hair pasta to the thickness of a child’s pinky. Some of the most popular wheat noodles include Lo Mein and Chow Mein noodles. Lo Mein noodles are thick and cooked to a soft texture. They are used is dishes with thick sauces and chunky ingredients. Noodles such as Chow Mein on the other hand are the exact opposite. These relatively thin noodles are either pan or deep fried without being boiled and create a crunchy bed of noodles that are used in stir fried dishes. 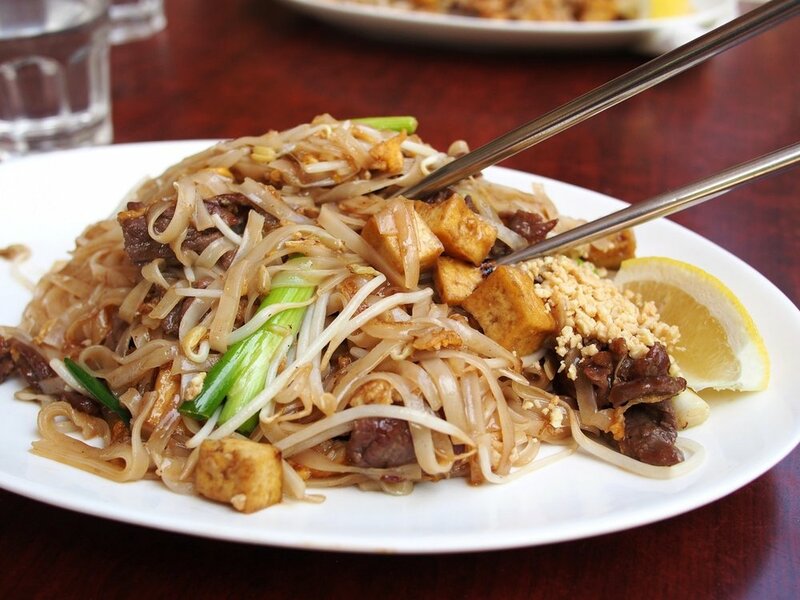 Rice noodles are made from rice flour and water and therefore are gluten free. They are very bland other than a subtle rice flavor and are meant to hold other flavorful ingredients together. Unlike noodles made from wheat, rice noodles do not need much time to cook, only enough to be rehydrated and then mixed with other ingredients. Rice noodles are used to make Vietnamese pho dishes and are also popular in Chinese, Thai and Malaysian cooking. Soba noodles are becoming progressively more main stream in Western culture and are even being promoted at popular chain restaurants that are not primarily Asian inspired. These noodles are made from buckwheat flour and are full of protein and fiber. The noodles resemble short, light brown spaghetti and are typically served in a cold broth or neat alongside one or two dipping sauces. When Soba noodles are served in a broth it is polite to slurp the noodles and broth. Some say the louder the better. Whether you choose rice or noodles there are an almost endless number of ways to pair them with other ingredients like Josephine’s Pantry Spicy Thai Blend. Another one of our SALT FREE blends packed with traditional Thai flavors for Stir Fry and Curry dishes that is equally delicious when used as a dry rub or marinade. Try it on Wings, you won’t be disappointed.